With all of the great discussions spawned by the "greatest MOOC conference in the history of MOOCs" (MRI13), it seems a good time to share a segment of a keynote presentation I gave last year on MOOC history. This presentation was at the American Association of the Colleges of Nursing (AACN) conference in April 2013. For context, I had just shared how online education was no longer an issue kept in the corner, away from mainstream higher ed, but was now affecting the traditional campus discussions. 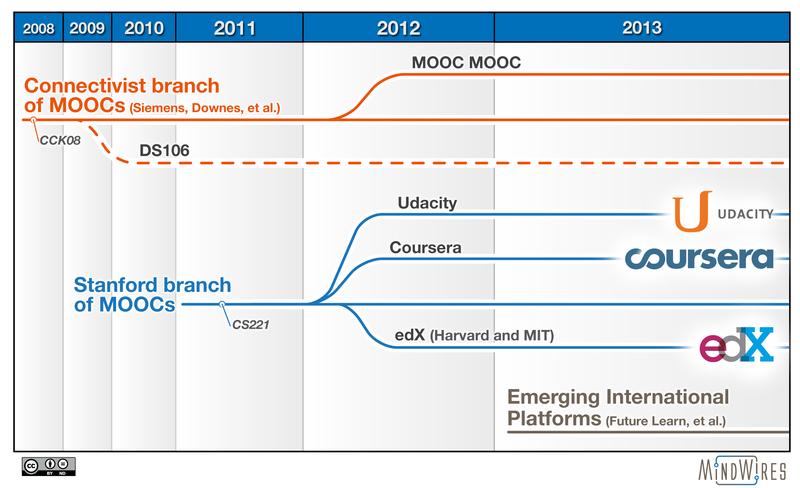 There is a relevant graphic that was shown during this segment of the talk, showing the MOOC timeline (updated version shown below).